Check URN status of your aadhar card online here – We cover the complete guide on how to check urn status of your aadhar card online here. In case if you have any doubts do leave a comment here ate the end of the post. URN number refers to the Update Request Number whereas the SRN number refers to the Service Request Number. SRN and URN are almost alike where SRN is provided to the Aadhaar card when he/she update the details of the Aadhaar card online. Similarly, URN is provided when the Aadhaar details are updated offline. 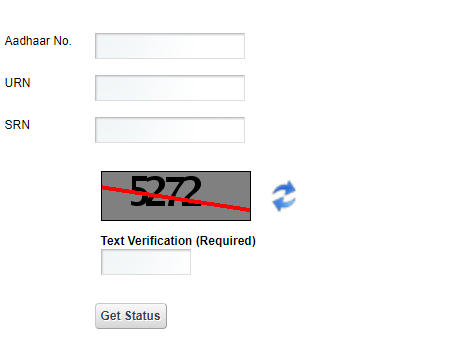 These two numbers are used to check the updation status of your Aadhaar card. This SRN number will be of 14-digit unique code which will be allotted to the user or Aadhaar cardholder if he rises a Service request such as Updation of Aadhaar card details. As we already discussed earlier the SRN and URN are used to track the Status of your Aadhaar card online through the UIDAI – Unique Identification Authority of India’s official website. In this article, you will get to know how to check your URN status online. Update Request Number or URN varies according to your Service or Update request. Same URN or SRN are not allotted to same or different person whatsoever. The following section of the article is like a Step-by-step procedure for your Check URN Status online. First of all, visit the official website of the SSUP portal of UIDAI – https://ssup.uidai.gov.in/web/guest/check-status. Click on this link so you can directly visit the SSUP portal. The page will appear as shown in the below image exactly. Then the user is required to enter all details as follows to check urn status online. Click on “Get status” button on below of the section. Once you click on get status you will be redirected to a page where all the details and URN Status – Update Status of your Aadhaar card are displayed. This is how you need to check the URN Status online. If you don’t have a URN while checking the URN status and was provided with SRN number, then the same procedure is to be followed to get to know the details of the Status of your Aadhaar card. While performing these procedures online you may encounter two problems. These problems are explained and discussed below with detailed solution to those problems. Sometimes, people face an error notice saying “URN is not valid”. It usually occurs like a pop up or in the “Check URN Status” section. The main reason for this is that the URN given to you is valid, but the UIDAI didn’t updated the Status section by updating your URN number into the website. Once it is done you can be able to find your Status. In most of the cases, you will get to know whether your Aadhar card has been updated or not through URN. If your Aadhar card still not updated, then, in this case, please do visit the nearest official Aadhar service center. After your Aadhaar card is updated you can be able to Download your Aadhaar card online with the help of the same SSUP portal itself. UIDAI provides an option for the Aadhaar cardholders to download their Aadhaar card in case if they are lost or updated. This Downloaded can be used an Address proof or ID proof anywhere. Go to the official UIDAI website to get a duplicate copy of your Aadhar card download. Under Aadhaar Online services panel, you’ll find UID Download Aadhar option in Aadhaar enrollment tab. Click on it. A pop will appear which says that it’ll take to a new page/tab. Click OK to proceed further. On the main tab, you’ll find two steps which need to be filled before submitting. Here there are two options from which you can UIDA download. You can be able to download your Aadhaar using either of the options. The only difference is that you have to select the mode of Procedure i.e., either through “EID- Enrollment ID” or through the “UID – Unique ID” which is an Aadhaar ID. Fill in all the details in their respective fields. After that, click on the “Get One Time Password” below. Enter the OTP in its respective field. Then Click on the “Validate & Download” where entered OTP will be validated and Download your Aadhaar if you enter the correct OTP. In case if you have any doubts related to aadhar urn number & status leave a comment here.